The PNV party just decided to support the no-confidence motion. The motion needs 176 votes and with the support of the 5 PNV parliament members it could reach 180. Spain and Italy could both have a new prime minister in the coming days. 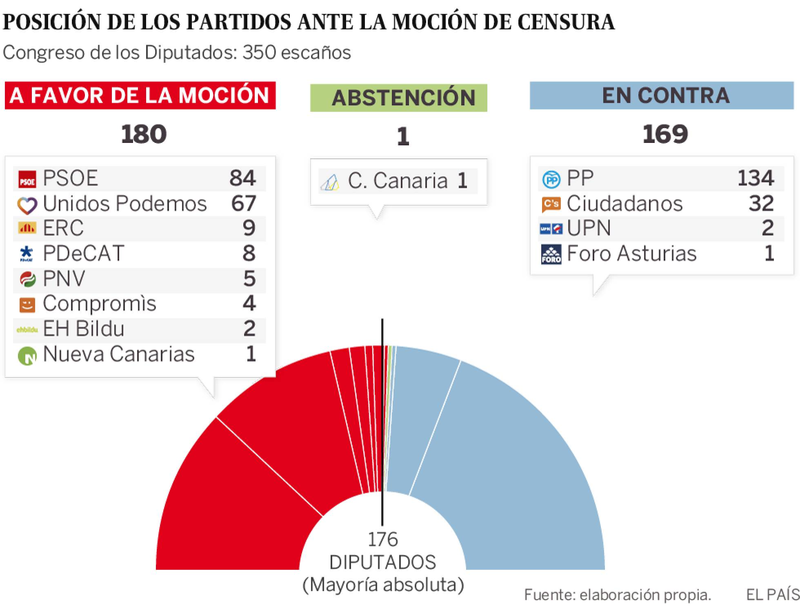 In Spain Pedro Sanchez has got the support of the little Basque Nationalist Party (PNV) and has now the numbers to overthrow Rajoy with a no confidence motion. With Sanchez, leader of the socialist party, as prime minister tensions on Catalonia could calm down as he is more open to dialogue than the hardliner nationalist Rajoy. But he will have to walk on a tight rope with a fragile and heterogenous coalition. In Italy, political newcomer Giuseppe Conte is back in the game and will be sworn as prime Minister in the coming hours. Matteo Salvini (Lega) and Luigi Di Maio (5 Stelle) have reached a new agreement to form a government. 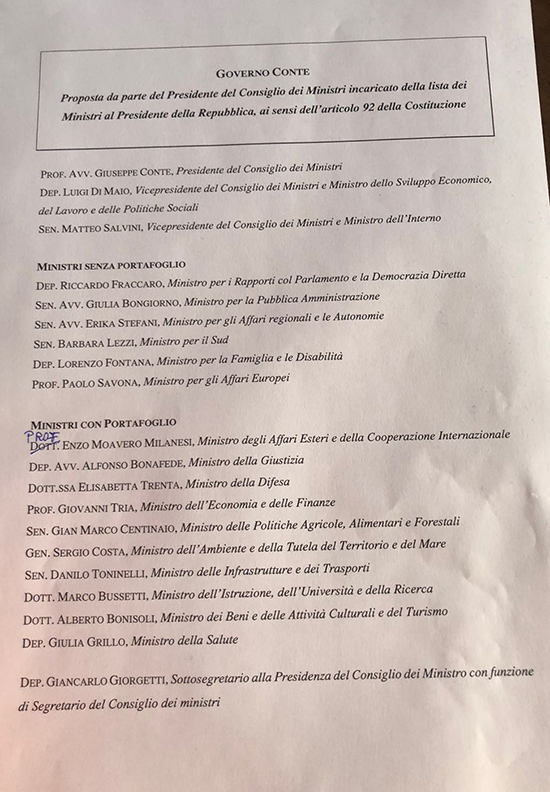 Di Maio convinced Salvini to step back from his insistence that Paolo Savona, an 81-year-old Eurosceptic, should serve as finance minister, a choice previously vetoed by president Mattarella. Savona will be part of the government as European affairs minister but the finance minister will go to Giovanni Tria, a little known economics professor in favor of keeping Italy in the Euro. The new government is expected to take a far more antagonistic stance against Brussels than the previous government, headed by the centre-left Democratic party. But the alliance between the M5S and the Lega will only have a relatively narrow majority in the Italian senate, easing some concerns among investors and officials in Brussels that the new government could take drastic actions. The various exits of European nations from The European Union seem like a corollary to the exits of the Red States from Obama's vision for America. He was quick to go on his Apology Tour after his first election. He and Merkel saw eye to eye on politics. Now she is an unwanted leader in a country angry at her. Europe has its own Trump light leaders trying to take over from the old guard. Chronic is perhaps an understatement. Great exposition by Tom Kirkman! Articles on the disintegration of the EU or the end of the Euro are as common as political crisis in Italy but the EU and the euro are stronger as you may think. The rise of populist euroskeptic parties across the continent is a challenge but it's far to be the end of the EU. Without the EU european countries wouldn't matter on the world stage and would be reduced to american or russian puppets. The same that are complaining now about Brussels would be complaining about Washington or Moscow. The Brexit is an isolated incident and not the start the EU disintegration. Many Brits voted for the Brexit as a protest vote against the government, thinking that the leave vote will never really win. Now they regret the Brexit vote. But some reforms are needed to adapt the EU institutions. Enlargement to the eastern countries was quicker than the strengthening of the institutions. But what lead to its weakness ? The "united states of Europe" was an answer to US monopoly. It would be bad for the world in case EU disintegrates. But why is EU ignoring such public concerns. How has it helped them ? Looks like "Brexit" would be followed by "Franxit" , "Spanixit" and "DeuteshExit". Not good for world economy. Here's my weekend comment over on LinkedIn, about the PetroDollar, PetroYuan, EURO, EU, and the potential disaster of a "Global Currency". It would seem the End of Days is approaching for the PetroDollar super-dominance. I would prefer that the PetroYuan become a viable alternate *choice* to the virtual monopoly of the Greenback. The Euro... had its chance and dropped the ball and has fallen and can't seem to get up. Hopeless dithering. So it seems the EU now wants to bring all other currencies down to its level of failure and control the world's economy... survival of the weakest. Utter piffle. If you want to imagine just how badly a "global currency" would fail, look no further than the EURO. Just imagine the EURO currency being shoved down the financial throats of every country in the world, by an unelected body of the World Bank. No thank you. Also, change is inevitable. And competition is good. 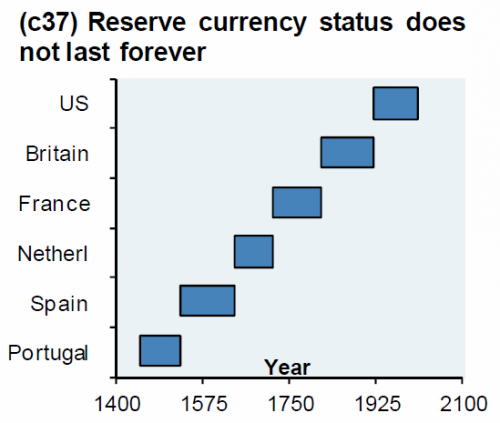 "Reserve currency status does not last forever." " ...Now an inescapable double-bind has emerged for Germany: If Germany lets its weaker neighbors default on their sovereign debt, the euro will be harmed, and German exports within Europe will slide. But if Germany becomes the "lender of last resort," then its taxpayers end up footing the bill. EDITOR'S NOTE: a version of this essay was published here on June 23, 2011. Nothing structural has changed in the seven years since the original publication." I can't say I have the feeling Romania, Bulgaria, the Baltic States or even Denmark, for that matter, are very important on the world stage even as members of the EU. And we are already puppets, some to more than one puppeteer, but puppets nonetheless. You're absolutely right about the complaining. People do so love to complain, don't we? If Romania, Bulgaria, the Baltic States or Denmark had to negociate separately with the US on aluminium and steel tariffs they would be far weaker. As long as they exported steel to the U.S. I agree with your point. However, even with the shield of the EU, many are dependent and not just on the EU for survival and relative wellbeing. it's the way of the world, nothing special or weird about it. The rise of euroscepticism is also normal, I believe, in the current political context. As I like to say, if you swing a pendulum too far in one direction, expect it to come back crashing down in the other one before too long. How can You all seriously think that the EU or the Euro can fail? And why You even think the people decide about Trump, Brexit or what will be the government of Italy or Spain?